SBach is the first two seat airplane able to perform competitively in Unlimited-Class Level Competition. Despite of the large size, the Sbach 342 is surprisingly lightweight and fast. AeroSky as the industry leader provided us the most impressive scale aerobatic airplane yet. 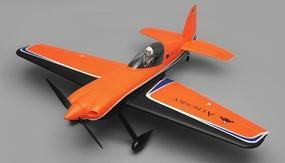 Powerful, beautiful, and durable, it allows pilots to try freestyle flying and all kinds of aerobatics without concern. Perfect for intermediate and advanced pilots. With its cutting edge and innovative modern design, the Sbach has good power to weight ratio and wingloading to help it excel in 3D flight. The Sbach 342 captures the attention of everyone who sees it up the air. The package comes with detailed assembly instructions so you can quickly get your new plane up in the sky. You are sure to be impressed with its build quality and ease of assembly. We've tricked out these beautiful SBachs with our SUPERMAX reinforcement. For the SBach and other 3D planes, we designed the reinforcement to enhance the balance, as well as reinforce the airframe. What this means is a number of things- for instance, the design utilizes tapered fuselage rods, much heavier in the nose section, tapering to a thin rod behind the CG. This gives the most protection in the likeliest impact area, and maintains the designed balance of the airframe. Another great innovation is wing rods that are FULL length, minimizing the flex and protecting against damage right to the very tip of every wing or fin. I could go on for a while, but if you really want to see what's in the design that makes it so good, get the "FOAM PREP" version, where we drill all the holes and put the rods in. You remove each rod, and glue it back in according to the instructions. It's a great way to learn how to reinforce the rest of your planes, Killer Planes style.